increasing land and building costs, and dwindling natural areas. The dependence on the automobile and its associated costs, coupled with the desire to reduce home-to-work commutes have increased interest in alternative types of housing. Demand for alternative development patterns, homebuyers, builders, planners and architects must address the need to provide attractive higher density housing opportunities that satisfy the desires of current homebuyers. Municipalities also need to consider how to ensure that higher density housing meets the needs of their residents and remains an asset to their municipality. Development that incorporates compact development design, both higher density and key community design factors, can contribute positively to the character of a municipality. Such development can take advantage of transit, utilities, and high land values that are found in centrally-situated suburban and urban locations, and can improve walkability. Compact development can also be combined with appropriately-scaled retail and commercial activities that can provide residents with convenient services that do not always require automobile use. Such retail and commercial land uses are often placed on the outer perimeter of higher-density developments, where they can also take advantage of customers on adjacent roadways. Such developments can involve densities of greater than five dwelling units per acre. In designing compact residential developments, it is important to consider the needs of residents for identity, safety, personalization, privacy, convenience and communal space, as well as compatibility with surrounding development and landscapes. Designers and builders must consider what people do around their homes, how they interact with each other in the neighborhood, where children play, and how all this relates to their existing surroundings. The purpose of this tool is to provide ideas and guidelines that can help achieve these goals. Provides affordably priced homes, achieved through an appropriate mix of housing types, and through minimized infrastructure costs. The following limitations may be associated with design considerations for compact development projects. These factors could act as a deterrent for developers attempting innovative designs unless they are addressed during the planning and design phase. Marketability and financial feasibility of innovative design concepts can be difficult. Successful compact development using higher densities depends on cooperation between municipalities and developers. Municipalities should review their land use regulations and identify any deterrents or disincentives to developers, such as rigid requirements for plan approvals, special review or conditional use procedures, inflexible financial guarantees, and other impediments to a streamlined review process. Offer incentives, such as density bonuses, to make higher density residential development an economically viable project. Specify action-oriented options to address planning and design issues. A zoning ordinance amendment may be needed to accommodate compact development or to incorporate alterative residential uses in an existing district. Amendments to the subdivision and land development ordinance should also be adopted to ensure appropriate design standards in higher density residential areas, along with ensuring that all information required to review development plans is specified in the plan submission requirements. Development Pattern (Density and Form): The development's overall size, dwelling mix, spacing of units, noise intrusion, access to open space for dwelling, variety in facade design, well sited community facilities, and parking can all affect perceived density and influence livability and satisfaction. Mixed Uses: A mix of land uses in proximity to shopping and other community facilities is helpful. 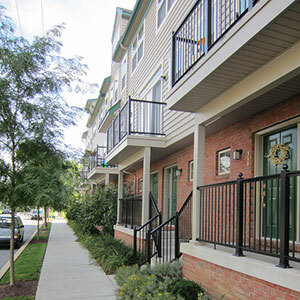 A residential unit situated above a ground-floor commercial establishment is re-emerging as a desirable housing choice. Transitional Filters: Transition between uses to define neighborhoods, e.g., bed and breakfasts, can serve as a transition between residential and commercial uses help mitigate potential conflicts between dissimilar land uses. Accessibility: Providing transportation choices is desirable in high density communities. Grid Street System: A street network comprised of a grid system can reduce confusion and disperse traffic more efficiently than a single access road or a cul-de-sac. Narrower Streets: Appropriately sized streets reduce accidents by "calming" traffic considerably and provide safety for pedestrians. Strong Pedestrian Orientation: Sidewalks are important to every "pedestrian friendly" community. Houses with front stoops or porches that are close to the sidewalk provide a feeling of safety while promoting impromptu meetings among neighbors. Shallow Building Setbacks: Smaller front yards, narrower streets, trees along the curb and sidewalks are all features of a "pedestrian friendly" street and neighborhood. Mature Landscaping: Landscaping enhances visual character, frames the streetscape, and provides shade and windbreaks. Protection of Privacy: Private entrances should be provided wherever possible to prevent neighbors looking into private yards and windows and to allow personalization. 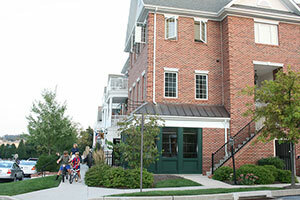 The Eagleview Town Center in Uwchlan Township is a successful example of both higher density residential development and mixed-use development. Eagleview contains a mix of different dwelling types including townhouses, apartments, and age-restricted retirement housing as well as commercial office and retail uses. The Pennsylvania Municipalities Planning Code, Act 247, enables municipalities to establish land use controls that can accommodate residential uses of various densities. References throughout the MPC indicate that diversity and community development are valid considerations in local planning and regulation. Article III, Section 301(2.1) promotes "different dwelling types and at appropriate densities for households of all income levels;" Article V, Section 503(5) promotes "flexibility, economy and ingenuity…in accordance with modern and evolving principles of site planning and development;" and Article VI, Section 604(4) requires a "range of multifamily dwellings in various arrangements…".